This experiential workshop focuses on developing our ability to use mindful, embodied touch and movement as a way of deepening our connection with our horses.Conscious Touch, Conscious Movement supports ease and balance in the bodies of both horse and human, helping us become more aware of what we are signaling with our bodies (and minds), and more open to what the horse is offering. How to use movement and touch to create congruence between what we are feeling inside and what we are expressing outwardly. Deepening connection, awareness and attunement with yourself and the horse. Simple movements to create ease and flow in your body and that of the horse. Letting go of habits of body and mind that may create unnecessary tension in you or the horse. Becoming more trustworthy to yourself and the horse. How to feel both giving and receiving with your hands and body. Noticing when our movement and touch is transmitting inadvertent or unintentional messages. Specific strategies for settling the nervous system when activated. How to integrate conscious touch and conscious movement into your day-to-day activities with horses. for more information about Paula. The clinic includes 3 overnight stays. The delicious meals start with dinner on the first evening and end with breakfast on the last morning. You will work with our herd of horses. It is not an option to bring your own. The clinic does not involve riding horses. For sleeping, you have your choice of elegant rooms with fireplaces and outdoor hot tubs, to glamping in tipis (yes, tipis!) – your choice. The maximum number of participants is kept low at 10 and we don’t accept auditors. To interact with the horses, you will be asked to sign waivers. Make sure you wear shoes with closed toes (no flipflops, slippers or sandals) and it’s always a good idea to dress in layers. Mountain Horse Farm is located in the beautiful Finger Lakes region, famous for its wineries and breweries, gorgeous lakes and waterfalls. You may want to consider adding a few days to your trip to explore the area. 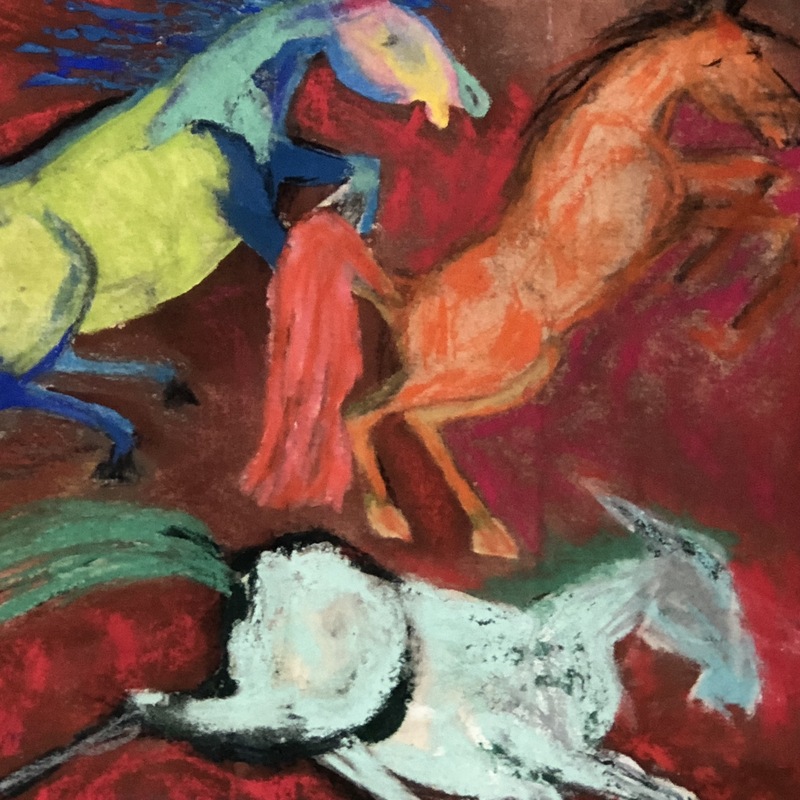 This experiential workshop focuses on developing our ability to use mindful, embodied touch and movement as a way of deepening our connection with our horses. 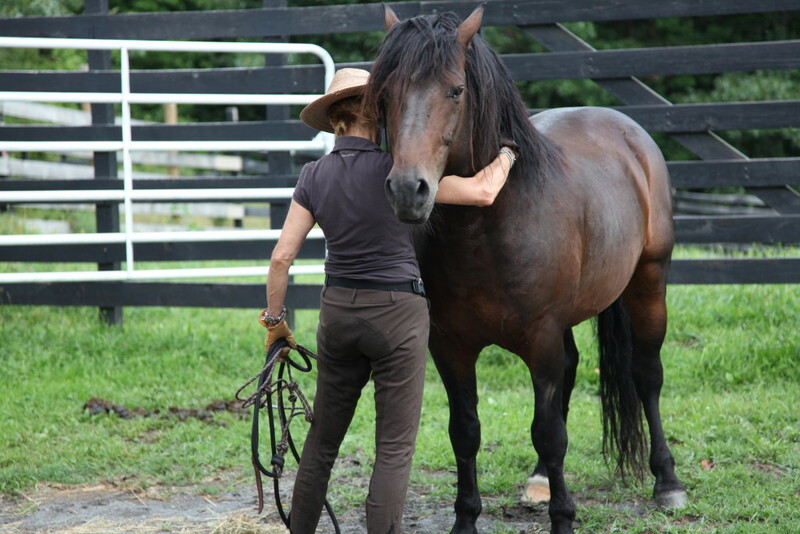 Conscious Touch, Conscious Movement supports ease and balance in the bodies of both horse and human, helping us become more aware of what we are signaling with our bodies (and minds), and more open to what the horse is offering. The clinic includes 3 overnight stays. The delicious meals start with dinner on the first evening and end with breakfast on the last morning. You will work with our herd of horses. It is not an option to bring your own. The clinic does not involve riding horses. During the clinic no other guests but Paula and the participants will stay at Mountain Horse Farm. For sleeping, you have your choice of elegant rooms with fireplaces and outdoor hot tubs, to glamping in tipis (yes, tipis!) – your choice. The maximum number of participants is kept low at 10 and we don’t accept auditors. To interact with the horses, you will be asked to sign waivers. Make sure you wear shoes with closed toes (no flipflops, slippers or sandals) and it’s always a good idea to dress in layers. This was a big year for Paula Josa-Jones/Performance Works and for me personally. For one thing, we successfully birthed River/Body. That project was in some ways like the baby that did not want to be born, with an ambivalent mother. Let me be clear. I love the project and love the river in ways that surprise me – I had not expected to feel such an emotional and potent sense of connection to this body of moving water. So what was the problem? In part, trying to gather $$$ support felt a lot like herding feral cats. 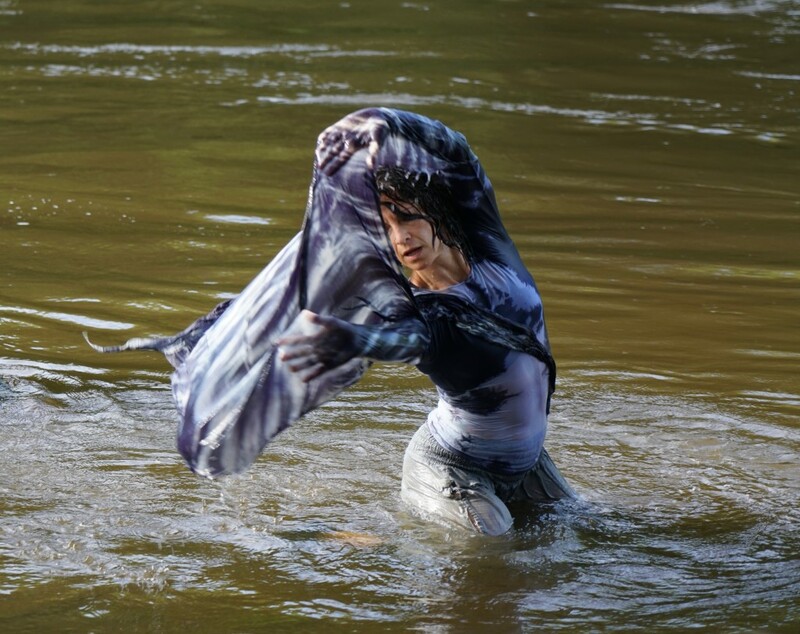 People are busy, or they “don’t get it.” What is this dancing in the river anyway? Why would you do that? What’s wrong with the theater? Again and again, I found my nose pressed against that hard wall. I get it. I know that there are a thousand worthy, incredibly urgent causes. Syria, Yemen, Central America, the looming climate catastrophe, animals that are suffering, children who are hurt, girls who are not being educated. But I feel that we each have to find a place of inspired action within this chaos. In this moment, mine is the river and its connection to global waters. I want to share the stunning fact (thank you Andrea Olsen) that within 16 days of living within a particular watershed, those waters literally make up the 70% of your body that is water!!!! Your relationship with your fluid neighborhood is not abstract — it is cellular, immediate. My other place of inspired action is the horses, and what they teach us about being human. 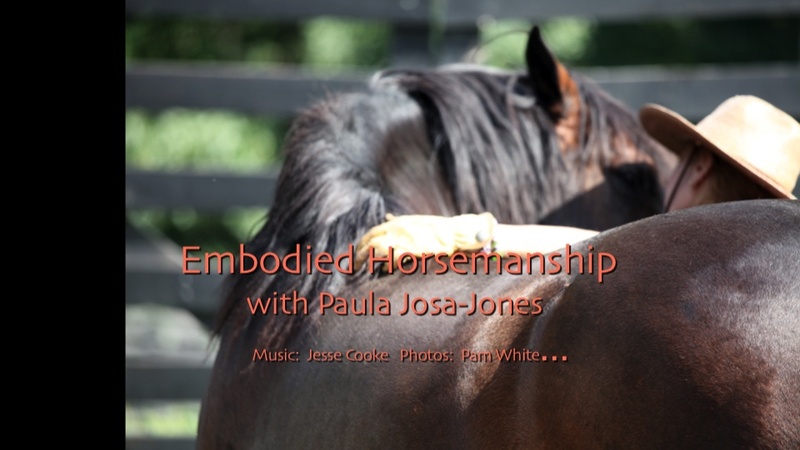 So I am making a video documentary of the new work I am developing with horses: Conscious Touch, Conscious Movement. It too is connected to this fluid theme. We are 70% water, as is the horse, which in the horse translates to 770 pounds or 96 gallons of water for the average 1,100-pound horse. Conscious Touch, Conscious Movement engages the body’s fluids to open a moving connection or flowing water dance that unfolds when we shift our awareness from muscles and bones to cells and fluids. I love this new work, this subtle, potent way of dancing with horses, and I love sharing it with clients and students. So tell me something: How can I better reach and connect this work with others? What are some inspired, perhaps unexplored fundraising ideas? What is important to you in your own work and outreach? I really want to hear from you! I had a wonderful time yesterday at Equine Affaire sharing my CONSCIOUS TOUCH work wth a receptive and curious audience. Boomer, the horse that I had been assigned for the demonstration was far from settled, but Pam White’s soft and balanced handling helped us all. There are still three days left to enjoy the clinic and workshop offerings and retail swag at Equine Affaire, so if you can make your way there, you will have fun. You can find my book, Our Horses, Ourselves: Discovering the Common Body at Trafalgar Square Books in booth #846 in the Better Living Center. On another subject, as you consider your holiday giving, please make a gift to our program, Horses Helping Horses. This is work that we have been doing for the past ten years, offfering educational and performance programs to equine rescue and sanctuary facilities, as well as organizations that offer equine facilitated work with adults and children with developmental delays. Your gift helps us to make our programs available to these wonderful organizations and support them in expanding and sustaining their work. Thank you! Please follow the link on the Horses Helping Horses page to make a donation.